This is the creamiest rice pudding ever. It’s so rich and the flavors are absolutely amazing! I’m going to be honest, up until a few months ago, rice pudding just really freaked me out. Every time my grandmother would make it, I would try it I would hate the texture of the rice. The only part I liked was the cinnamon on top. I think this was because every time I had rice pudding, it was not homemade! For some odd reason even though I wasn’t the biggest fan of it, for the past week I have had such a hankering for it!! So I decided to create a homemade version. OOOMG. Let me tell you. It is ah-mazing. Seriously guys. From the vanilla flavored pudding base, to the soft rice to the cinnamon in and on top – ahhh so good. In my recipe I added egg yolks instead of whole eggs because I thought about my chocolate pudding recipe and it calls for all yolks. It’s amazingly creamy and I wanted this pudding to be as creamy as possible so that’s what I used in this recipe, but only used two. Egg yolks also create an incredible amount of richness. It is just the right balance of creamy and rich without being too much. This pudding is addicting. Sooo addicting. Taking these photos was extremely difficult because I was trying so hard not to steal spoonfuls of it (which I wound up doing anyway!). Self control? What’s that? I even had some for breakfast yesterday! It’s really good warmed in the microwave just for a few seconds. The rice acts as a natural thickener in the pudding so there is no need for cornstarch. After the first addition of milk it’s going to feel like an eterrrrrnity waiting for it to thicken up and it’s going to look like way too much milk but really, it’s not. I was worried myself the first time I made it, but I promise it will thicken up in about 20 minutes! Just have patience. ^ I know that picture looks a little unappetizing, but look how creamy it is! I added cinnamon into my pudding, that’s optional, but it’s my favorite. I also added a bit of brown sugar, which you don’t normally find in rice pudding but it compliments the cinnamon flavor so well. 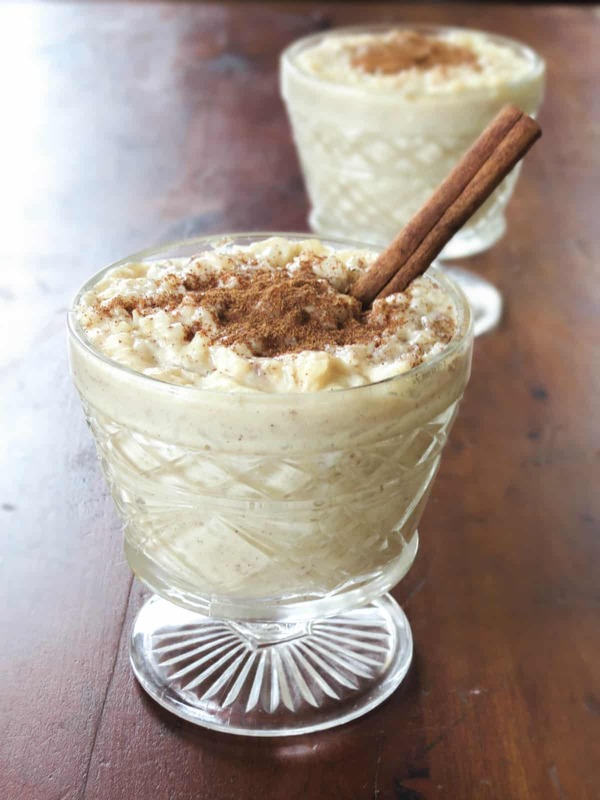 If you love rice pudding you will absolutely love my version! It is extremely addicting! Can’t say I didn’t warn ya. Boil rice, water (amount of water goes according to directions on box), granulated sugar and salt in a medium saucepan until completely done and tender. Pour in half and half + 1/2 cup milk and simmer on low for 20 minutes, stirring every few minutes until thick and creamy. It may look like it's too much milk and it will never thicken, but it will you just have to wait. Once thickened, Mix in brown sugar. You used Minute Rice, I use the regular kind, So how much rice is needed when once cooked ? Thanks for your speedy reply. Just use the same amount of (uncooked) rice as called for in the recipe and follow the directions on the box you are using! Hope this helps! Hi. I want to put raisins in mine. When should I do that? Beginning or end? I would add them in during the last 10 minutes or so. I made rice pudding for the first time today using a low cooker. It looks and smells delicious but It has a dry texture. Any advise on how I can make it creamier? Yum!! I would try adding more cream possibly. Yes, do not cover rice pudding no matter which version you are trying. Evaporation to reduce and condense the milk into the rich creamy goodishness. You never said what to to with the unsalted butter. I meant neck… rub it on our neck Like perfume. Geez I love my addiction to butter. Thank you so much for sharing this recipe! I have made it several times and my family absolutely loves it! That’s awesome, Terry! Thanks so much for letting me know! The water does not get drained! It will soak up into the rice while cooking the pudding. 3/4 c of raw rice makes about 1 1/2 c cooked (about double). I used 3/4 c minute rice and followed her liquid measurements exactly and I have lovely pudding. Maybe you mis measured ? It sounds like you thought the rice would cook in the liquid in the recipe, in other words the half and half and milk. You have to have the rice already cooked for this recipe or use the Minute Rice. Yep. It’s easiest to start with cooked rice in my experience anyway. Regular rice is very thirsty. Recipes with uncooked rice that are to be baked use a huge ratio of liquid, up to 4 cups of milk (no cream) with 3/4 cups of rice. Probably adding one more cup of milk and cooking a bit longer would fix. Sounds like you tried cooking the rice in just the milk. Try cooking the rice according to the directions on the packaging for the rice as well as the granulated sugar and salt in a medium saucepan until completely done and tender. -Then proceed with the addition of the other ingredients. About 2 1/2 cups cooked. Arborio rice which you make risotto with works beautifully in rice pudding….love it with cinnamon sugar sprinkled on top! Do you cook the Arborio rice normally and then add it to the recipe? I have some of that at home. This is the BEST Rice Pudding EVER ! I found the directions PERFECT . I at first tasted it and then could not stop eating it right out of the pan! Thank You! That’s awesome! I’m so happy you liked it. Now you have me craving it! How many servings is this suppose to be ?? Do I double the amount if I am doing 3 cups of rice ? 3 cups of rice would require quadrupling the recipe. If you’d like to make a huge batch like that, it might be easiest to bake it in the oven. Half & half. Half & half is half & half. You can buy it in cartons in the grocery store. It’s basically halfway between milk and heavy cream. Exactly! Thanks so much for helping out, Sam! Hi Jessica, just saw your recipe while looking up rice pudding. Just a note to those wondering what half and half is. It’s half milk and half cream. Do not buy fat free it’s full of icky stuff. Simple answers are usually the best! I’m sure I’ll enjoy your recipe! 10% is awesome. USA heavy cream is maybe 5%? Will you be getting USA 1/2&1/2 now that Nafta was changed? More fat but less sugar than Cereal Cream, not by much tho may be of interest to diabetics. You can make your own half and half by mixing one Tbsp of melted butter in a cup of milk. this is the best rice pudding recipe I’ve ever come across! I followed the directions except I doubled the white sugar. I will be making this often…so good!! That’s so great to hear! Thank you and thanks for reporting back! That sounds like a great addition! I made a batch of this last night too, so good! I made this recipe at the insistence of my husband who loves rice pudding. (Only he required that I add raisins) I myself had never tasted rice pudding. I just couldn’t grasp the concept. I mean rice is for dinner, pudding is a dessert you can’t mix the two right? Wrong! Boy was I wrong. As others have commented I tasted right from the pan and I was an instant fan! It was delicious. Thanks so much for sharing. I know, right?! I always thought the same thing and this is the recipe that changed everything for me! Lol, too funny. I’m so glad you guys loved it, Rhaina! Hop online and check out oriental rice desserts. You’ll be amazed. 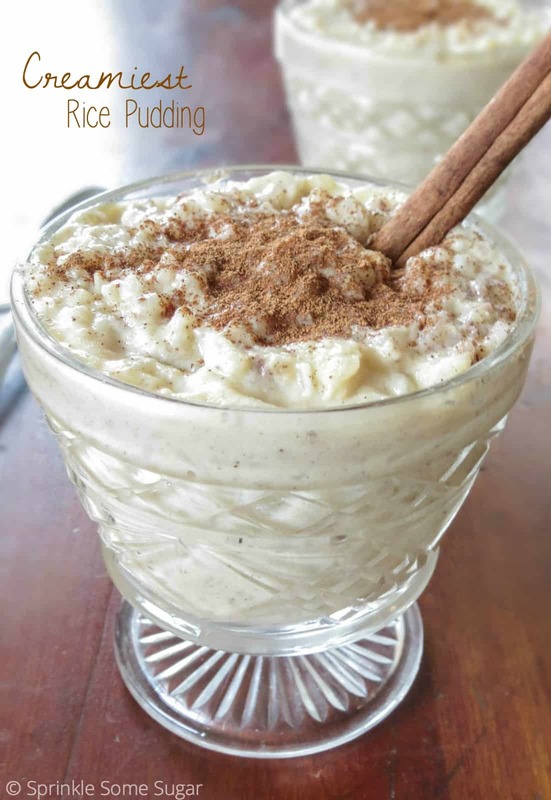 Just tried this recipe…hands down the best rice pudding!! i am making this now, does anyone know at what point I should add raisins? Perfect! Rum soaked raisins do add extra flavor but make sure when you drain the excess rum, you drink it. So the end result makes how much pudding? I’m going to a potluck and wonder if I should double the recipe. I’m not sure exactly how much it makes, but it makes enough for about 4-6 generous servings. I would double the batch for a potluck (I doubled this recipe for Easter and it was more than enough, especially when there are other desserts!) When I double this recipe though, I do it in separate batches because I have found that when I double it together it doesn’t come out as good. Hope this helps! I made it today for my husband Milan who loves rice pudding. At the end I had beaten the egg whites and folded them into the cooled pudding. It made it even better and besides, it’s a shame to throw away the whites. Thank you for the wonderful recipe! That’s good to know and you’re welcome! If you use leftover rice that is already cooked, how much would it call for? Looks amazing, and can’t wait to try! And I’ll be putting in the same glass dishes. They were my grandma’s and she bought them individually with peanut butter in them! These are my grandmother’s glass dishes too! Can this be frozen? To save some for later? I’ve never done it myself but here’s an interesting article with tips for freezing it! http://canyoufreeze.com/rice-pudding/ Hope this helps, Erica! Half and half is basically a mixture of whole milk and cream. I’m not sure where you are located, but you can normally find it in the refrigerated section of your grocery store near the milk. Can i use something other than half-and-half? Like some sort of heavy whipping cream mixture? I just made this recipe for my family. They now have a new favorite. My young grandson cried for more when he finished his bowl. We put raisins and blue berries in ours. I will be making this again. Thank you for sharing the recipe. Aw, that is so great to hear, Kim! You’re very welcome. Blueberries and raisins sound yummy in it. Just made this for the first time for Christmas dinner. Easy to make and absolutely fabulous! That’s so great to hear! I hope you and your family had a wonderful Christmas! The taste is really really good but mine got so thick it wasn’t pudding anymore. I followed the directions exactly except used Uncle Bens white rice. What went wrong? So sorry that, that happened, Michelle! I’ve only made this recipe with minute rice so I’m unsure what happened. I think maybe the rice soaked up too much of the liquid, maybe try adding more liquid next time or stick to minute rice. Thank you for this rice pudding recipe. We love it. It has taken me 30 years to finally find a rice pudding recipe that comes out amazing! You’re very welcome, Tina! I’m so glad you found a recipe you love! That’s so amazing to hear! You just made my morning. I love rice pudding. Usually, I make extra rice for leftovers to use in rice pudding. It’s great for breakfast, lunch, and dessert. I made this tonight for my husband and added nutmeg. It was wonderful. I’ve made Rice pudding before but the brown sugar made a difference. Nutmeg sounds like a yummy addition. I agree, brown sugar makes a HUGE difference, it gives it a richer flavor. Use fresh ground nutmeg, makes a real flavor difference. Ratio is 25% (1/4 tsp fresh ground = 1 tsp pre-ground). I am from South Africa and have never heard of half and half ( had to google it) but we don’t have it here, can I just use half cream half milk instead? Yes! That is essentially what half and half is so that is a perfect substitution! I have been thinking of rice pudding for weeks, do not know why. Your recipe looks delicious ,gonna give it try. I have always uses my mother’s recipe for rice pudding, but was enticed by the great comments to try this one. Wow! Absolutely divine and when I served it at book club, it was a winner. I did add raisins and a drip of vanilla. Thank you so much! Yay, that’s so great to hear, Pauline! I’m happy this rice pudding went over well at your book club! I am so glad I came across this recipe. 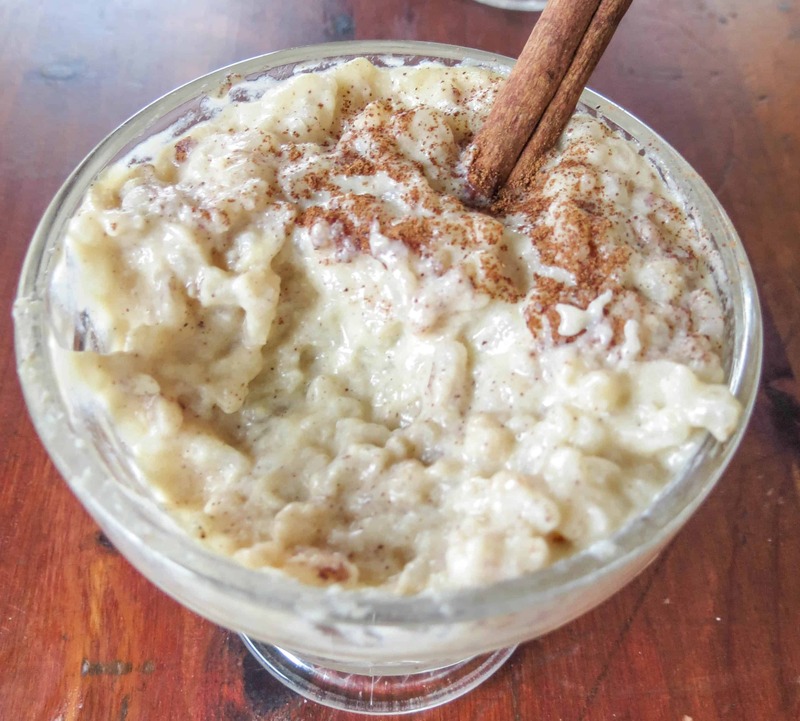 I have been searching for years for a rice pudding that was like my grandmas and this is it! It’s so creamy and delicious. This makes me so happy that you found a recipe like your grandmother’s! Thanks so much, Hailee! Just made this and it’s been a huge hit! Already writing down the recipe in triple the amount (have requests to bring this to Thanksgiving). You now have another loyal follower! Oh, thank you so much Phil! You just made my day. And this is definitely a Thanksgiving favorite at our home too. I loved this. Somehow missed the part about minute rice and used regular rice. It was fine. I didn’t have half and half and used evaporated milk instead. It is absolutely delicious and creamy and addicting just as you warned. When it cools im going to try and brulee the top for. A prettier presentation. Thank you for sharing. Can I make it with cooked rice? I have some left over from dinner and my husband loves rice pudding! Hmm, that’s a good question! The first step of the recipe the uncooked rice boil with sugar and salt because it infuses the rice so I’m not sure if the cooked rice will take on the sweet flavor as well. If I were you, I would still do that step, but use half of the water just to let the flavors soak in and allow the rice to soften up a little but more and go from there. You can always add more liquid as you go on if you need it. Let me know how it turns out or if you have any more questions! Yes, it is definitely ok to use cooked rice. Rice pudding needs the rice cooked out longer to a softer consistency than how rice is regularly prepared for a meal, so there is still plenty of time and space for leftover cooked rice to take on the flavors and textures the dairy and sugars impart in a proper rice pudding. I just made this with canned coconut milk for the half and half, and regular coconut milk (sold like cows milk) for the milk. Very good! Thank you four the recipe! Wow! I have never made (or tasted) rice pudding before, but this is delicious! I happened to stop on the Food Network as I was flipping channels, and someone on a cooking competition show made rice pudding. I decided that I just had to have some at 9:00 at night. This recipe was the first I found, so I went with it. So glad I did! I didn’t have all of the ingredients, so I made several substitutions/adjustments. First, I only had brown rice (the 5-minute kind, but I cooked for about 12 minutes to get it tender). No half and half, so I used heavy whipping cream. I was out of milk, so I used sweetened vanilla almond milk. It took about 30 minutes to thicken. After adding the egg yolks, it looked like the perfect texture, so I decided not to add the other 1/2 cup of almond milk. I also used salted butter. Once done, I topped it with sliced almonds. I loved it, and so did my husband! Of course neither of us has anything to compare it to since this was our first time. I would probably reduce the amount of sugar and vanilla next time, if I use the sweetened vanilla almond milk again. Yes! They are what gives pudding its creamy consistency. The yolks are not needed . Although it does make it more creamy. As long as you bring the temp up to 160 ° F for 3 min. It’s ok to eat while pregnant. Some recipes do not even call for eggs or yolks as others do, but I have found that the small bit of yolk adds a subtle but real richness to the flavor as well as the texture. Another ingredient that can enhance is a wee bit of lemon or orange peel zest. Adds just the right amount of brightness give the flavor depth. Could I use jasmine rice? I don’t see why not. I have not tried so I do not know for sure. If you test it out, let me know how it works for you! I made this recipe and I absolutely love it. This will be a regular in my house. Thank you for the great recipe! Yay! Thanks for reporting back, Leah! Excellent! I cooked my mid grain rice in the instant pot with the sugar and salt for 4 minutes high pressure, then natural release for 10 minutes. Followed the rest of the recipe exactly, and it came out perfect! I just made this with some left over brown rice from dinner earlier in the week. I used 1.5 cups cooked rice and added it to the milk and half-n-half with sugar and salt. I followed the rest of the directions as written and it tastes amazing. Now it just has to pass muster with my husband and kiddos. Can I use instant white rice? Yes, that is what is used in the recipe. Omg!!!! Just made this w Success Boil in a Bag white rice…TO DIE FOR!!!! First time making it, as well. Thank you so much for this recipe. You’re very welcome, Dawn!! Glad to hear it comes out great with that rice as well. What kind of milk do you use for this recipe? Does it matter? Nope! I’ve used 2% and whole both with the same results. OMGEEEEEEEE!! This is absolutely amazing! I’m sooooo going to make this for dessert when we have guests over. Thank you for sharing ! Yay! Happy you enjoyed it, Kelly! What grain length rice do you use? Medium, long or extra long? You really can use any type, they all taste good and work. Some rices may just need a bit more liquid and/or cook time. Rice pudding by nature isn’t an exact science (say like with baking pastries, etc). It is very forgiving. Even within the same batch it can easily be adjusted to a desired consistency. Might be perfect the night we make it but seem dry the next day… no problem, just stir in some milk or cream and enjoy all over again. Very good recipe Jessica, thanks for publishing. I made this tonight with our Danish exchange student, she loved it. We’ll be diving into your website for more recipes. Cheers from a new fan in Minnesota! Do I have to put in eggs or not? Yes, they are needed in this recipe to produce the custard. Thinking about using pumpkin spice creamer instead of half half. Think its a good idea? Well, if pumpkin spice salmon can be a popular trend then pumpkin spice in a very neutral dish such as rice pudding should pose no problem at all. I made this rice pudding and it was /is the creamiest and most delicious I have ever had. I added a cinnamon stick when cooking the rice to infuse more cinnamon flavor (tip I learned years ago), and it was sooo good! Thanks for sharing this recipe. It’s a keeper for sure!! Will be making for years to come!! You can try using half heavy cream and half milk. Using only heavy cream would be way too thick in my opinion. Heavy cream alone would be too rich and you’d also risk the dish breaking (where the fats separate and leave a greasy layer). The non-cream part of milk is also necessary to develop the flavor here. I was looking at the recipe but didn’t see the serving size. How much does this make? I made this for the first time after seeing it on line and oh, I am definitely making this my first choice in rice pudding. I made it exactly to the directions and could not ask for a better result.It was so smooth, creamy, and delicate in flavor. I will absolutely be sharing this recipe with friends. Thank you for sharing this recipe with me and others. Also, as mentioned in a previous comment, this recipe makes about six 1/2 cup servings. Woooo! Thanks so much Mary! This is definitely one of my favorite recipes as well. I don’t make it as often as I should! Just made this and it was delicious. Followed the recipe exactly and it turned out flawless! Husband approved! Ithis was my first time making rice pudding. It came out pretty thick which is fine with me. Tastes great. I was confused at first as i used regular rice so was nt sure while i was boiling it to cover ornot. I just didnt cover it but i didnhave to add water sometimes to prevent the rice from sticking to the pan to much. And after everything was done i made about a pints worth and everyone liked it. Hi, I used unsweetened almond milk for the milk…. It added an amazing flavor! Try it. I also sprinkled some honey toasted pecans and (cooked) dried cherries in. It was so good. Now my house smells like baked cookies! I just made this with regular long grain white rice. It turned out great. But I cooked the rice first, 2 cups water to 3/4 cup rice, nothing else. When the rice was mostly soft I rinsed it at least twice in water to get all the starches out. Then I began your recipe. And love the texture and flavors just the way they are. mmmm… not sure you need or want to rinse the rice starches out of this dish, pretty sure the fine rice starch helps create the silky texture. Is it really ok to put the sugar in and then cook the rice with it? I’ve never cooked rice with sugar like that. Thanks! It’s ok to put the sugar in with minute rice. If using regular uncooked rice it’s best to wait until the last 10 minutes. The rice will cook quicker and you won’t risk the sugar burning to the bottom of the pot. To follow this recipe here, use 3/4c of rice. Hi! I love this recipe,its absolutely amazing!!!! I actually used heavy cream in place of half and half and it came great! I’ve been making this recipe for a few years now and love it. Recently I’ve been having issues with dairy and have switched to almond milk. I have slightly tweaked your recipe and it is just as good with vanilla almond milk. Instant rice doubles and raw rice triples in size when cooked. Make with 1/2c long grain rice to equal 3/4c of instant rice. 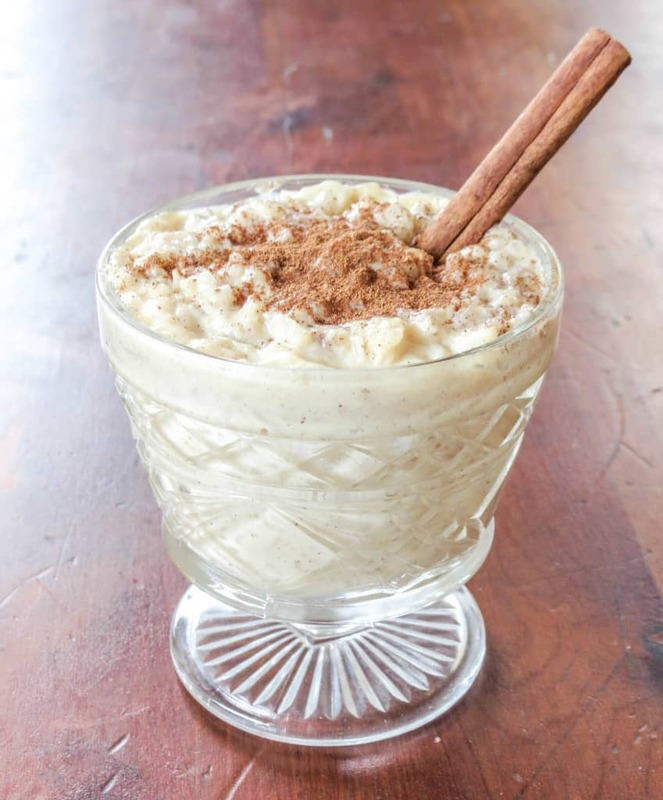 I’ve been using your recipe for a few years now & it is hands down the best rice pudding ever. I always double the recipe because a single batch is never enough & we love the cinnamon so I just dump it in. Thanks for sharing this fab recipe. P.S. I serve it with vanilla ice cream. The combo of hot & cold really works great together. I made this with leftover rice. Not having an exact measurement of rice I added extra milk and eggs. When it was done cooking it was thick and creamy. Once cooled it was a block of cement. I mix in milk or cream to make it creamy again. It would be helpful if there was a picture or video showing the consistency of the pudding. I would have added more milk had I known it was going to cool into a solid mass. The recipe states to use uncooked rice. Please follow the recipe next time before commenting. Sorry the recipe didn’t work out for you with your changes, Sarah! Rice pudding is always different between the day you make it and the following day. Rice continues to absorb available liquid over time and the rice starches floating in the pudding part continue to plump as well. No problem, you did the right thing. Just add more milk to get it to the consistency shown in the above recipe photo. Just made this and it is absolutely perfectly delicious! I wanted a rice pudding recipe that was creamy and not “gloppy”. This turned out exactly the way I wanted it. I forgot the butter……….boo, but will make sure I remember next time. it was still amazing! Can I make this with brown rice? You can use brown rice, it just won’t have as pleasant a texture. If you’re used to eating brown rice, it likely won’t be a bother. Just made this with raisins for my dad and husband. This recipe was so easy to follow and turned out absolutely amazing! For the raisins I soaked them in a little bit ofRum Chata and Jack Daniels. Added a nice little touch for the grownups to enjoy. Thank you for such a great recipe! There really is no need to be nasty. I’m sure it was an oversight on Kayla’s part. Have you ever missed something when reading…even when you have gone back? Jessica, WOW! so simple, yet SO tasty! This is fantastic, yum. Thanks for the recipe.